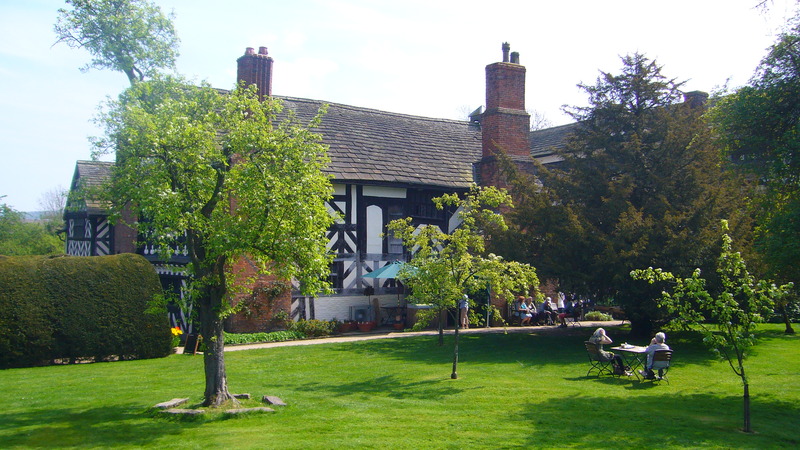 There is nothing more splendid than enjoying afternoon tea on a wide, sloping lawn as the summer sunshine dapples the grass. While taking tea served to you on the lawns of a beautiful English garden is one of life’s little luxuries, afternoon tea doesn’t have to be a complicated and cumbersome affair. It’s quite easy to serve a simple and stylish version of afternoon tea in a more relaxed and informal setting for your friends at home. 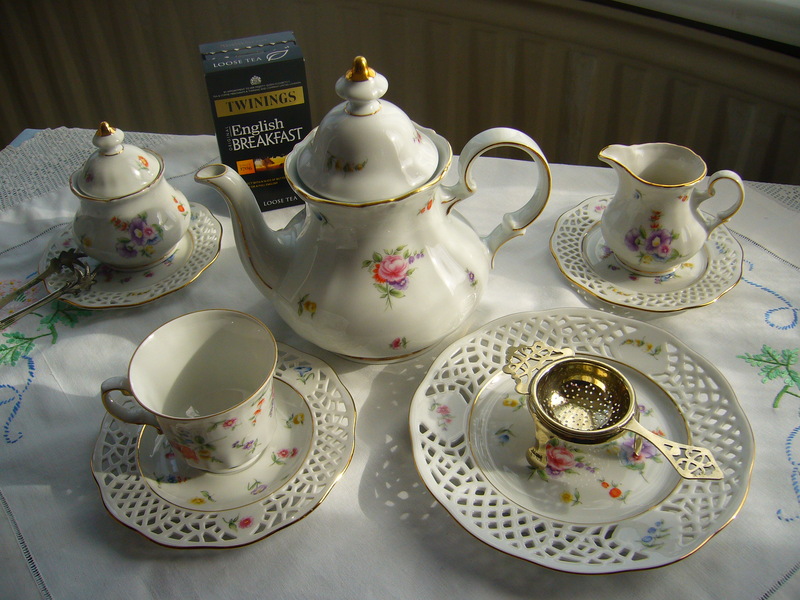 The essential equipment serving afternoon tea is a good quality ceramic tea set. There are many different types for you to choose from, but always remember to let your own personality shine through when you choose your own tea set. 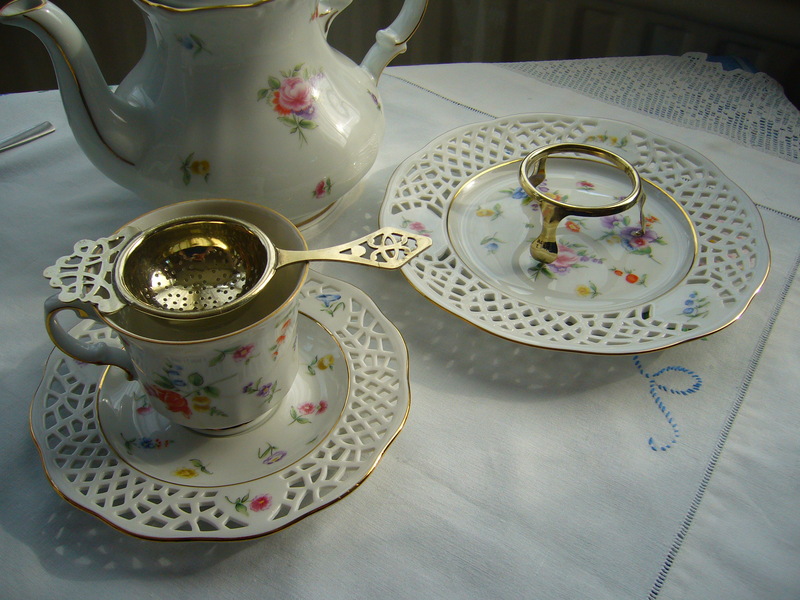 As well as the traditional teapot, matching cups and saucers, sugar bowl, and milk jug, you will also need a tea strainer. 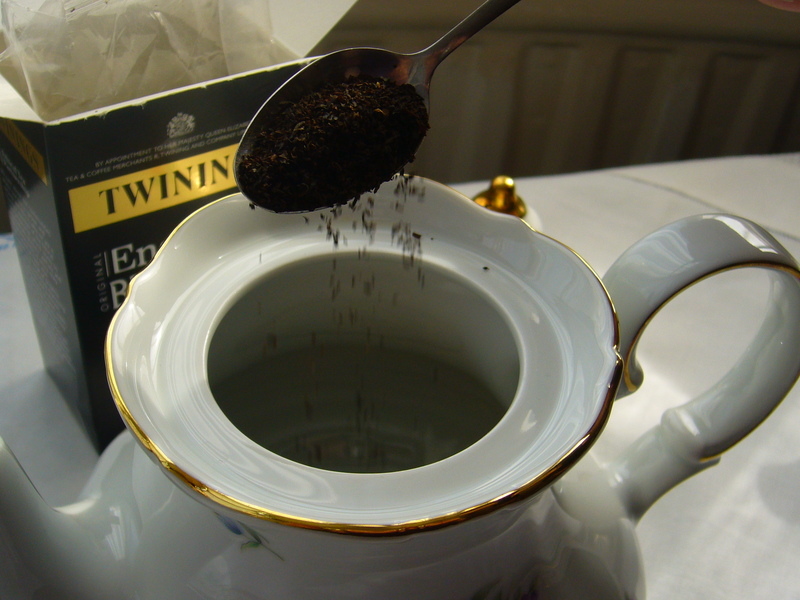 I have decided to use loose leaf tea because of its unparalleled flavour-in this example I’m using Twinings Loose Leaf English Breakfast Tea due to its light and crisp flavour on the palate which is a refreshing drink at any time of day. There are a selection of loose leaf teas available from the Twinings website. The first thing to do is to draw some fresh cold water from the tap to fill an electric kettle and leave it to boil. 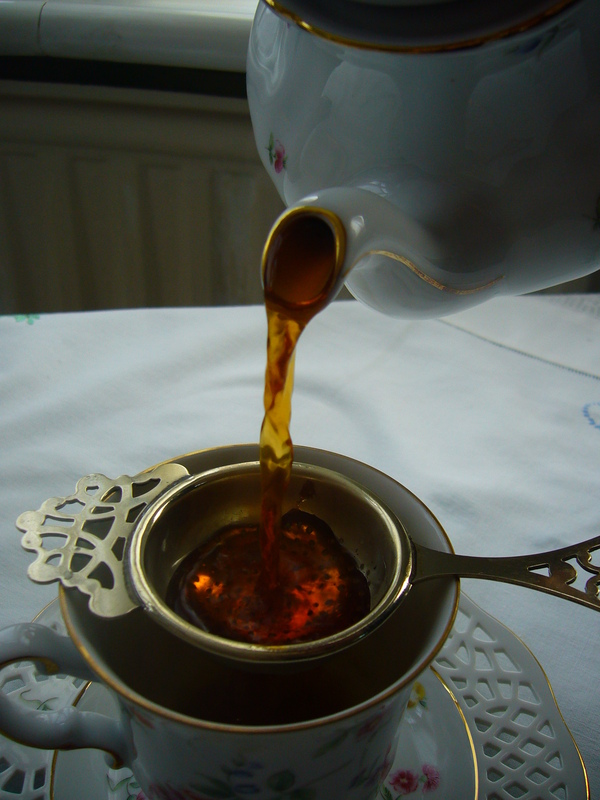 Once the water has come off a rolling boil, pour it into the empty teapot. 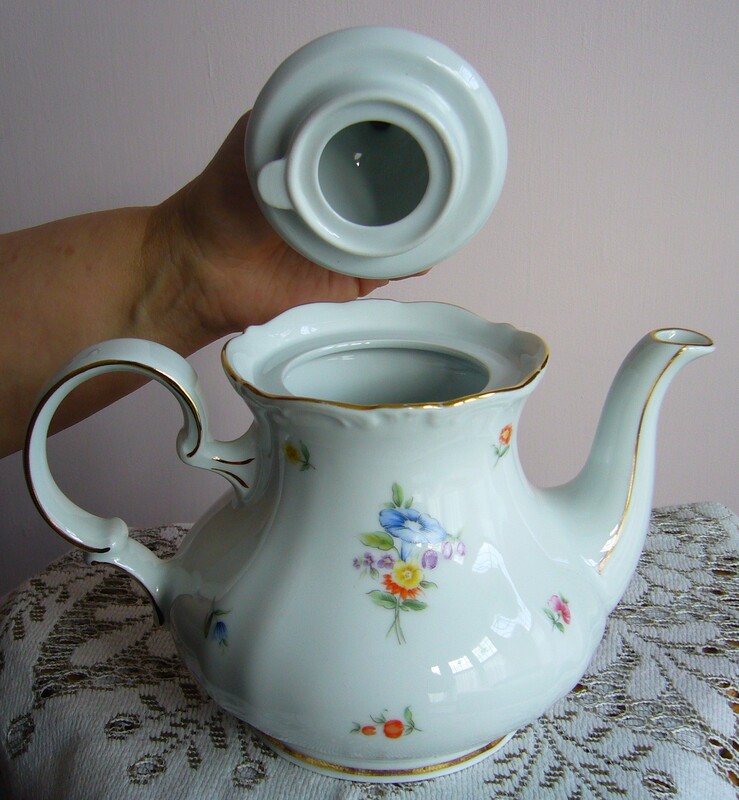 This will warm the ceramic and make sure that, when you brew your tea later, it will not go cold quickly. On all teapots there is a special skill for making sure that the contents remain as hot as possible for as long as possible. 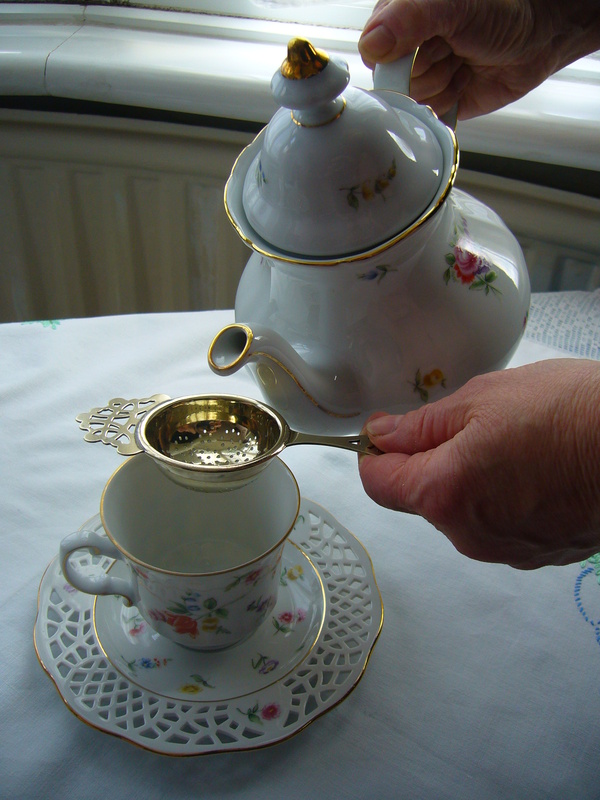 If you lift the lid of the teapot and look on the underside, you will notice that there is a little lip of porcelain that sticks out at 90° from the rest of the circular rim. 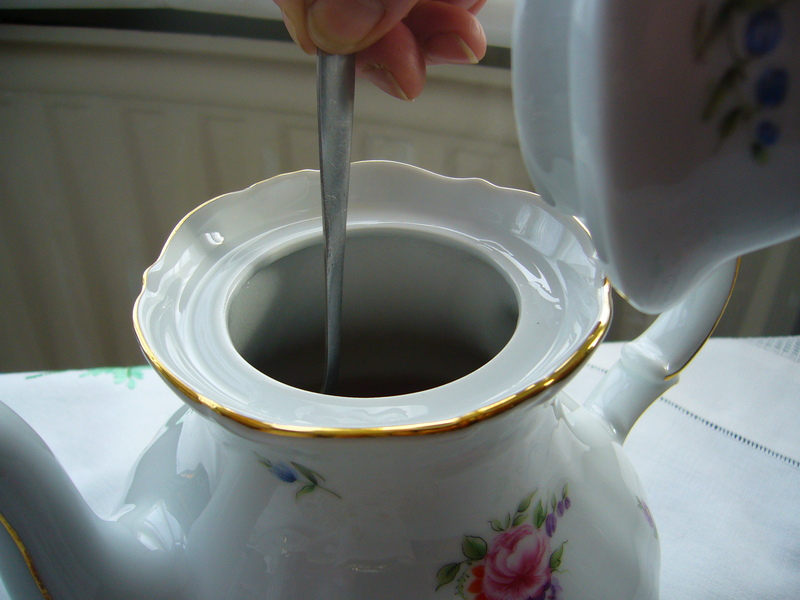 This lip needs to be placed underneath the rim of the teapot and needs to be directed towards the handle of the pot in order to maximise heat retention. 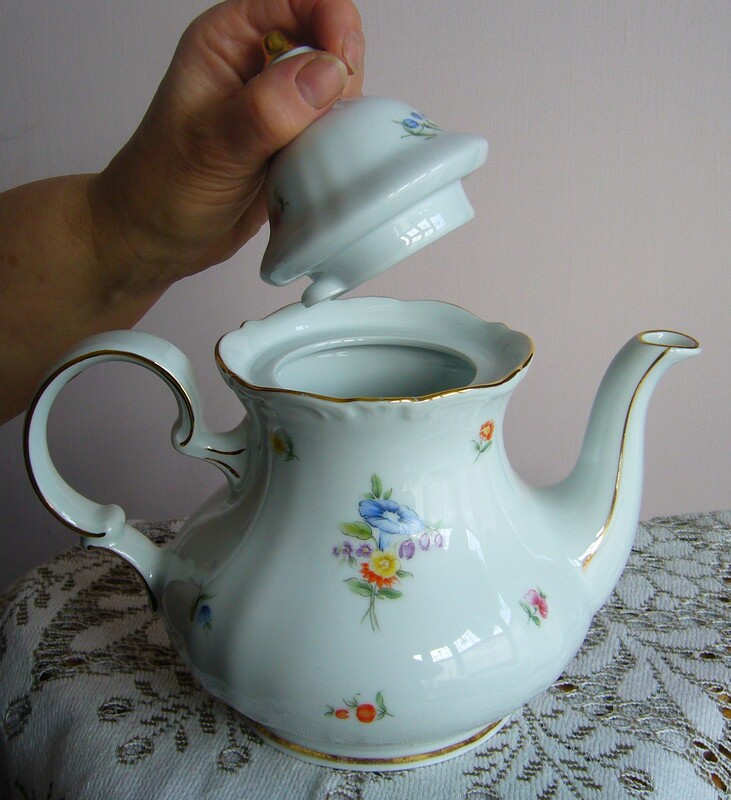 Try to make sure that the teapot’s lid is fitted correctly, with the lip facing the handle, when you leave the boiling water to warm the pot. Before you do anything else, fill the kettle with fresh water again and leave it to boil. Once the pot has been warmed, you can throw away the hot water. The next thing to do is to work out how much loose leaf tea you will need for your afternoon tea. The general guidelines are one heaped teaspoon per person. If, however, you and your friends prefer your tea strong, you may want to add one more teaspoon “for the pot”. 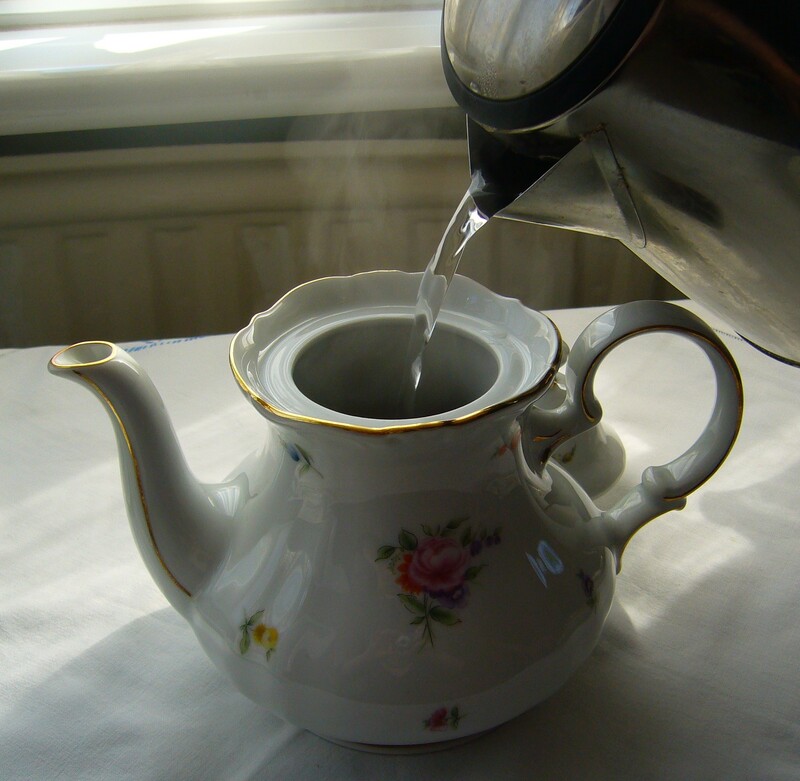 Once the kettle has boiled, add the hot water to the teapot, stir, and then put the lid back on the teapot. Now a little patience is required while you leave the tea to brew in the pot. The best length of time to leave loose leaf tea to brew is 4 min. 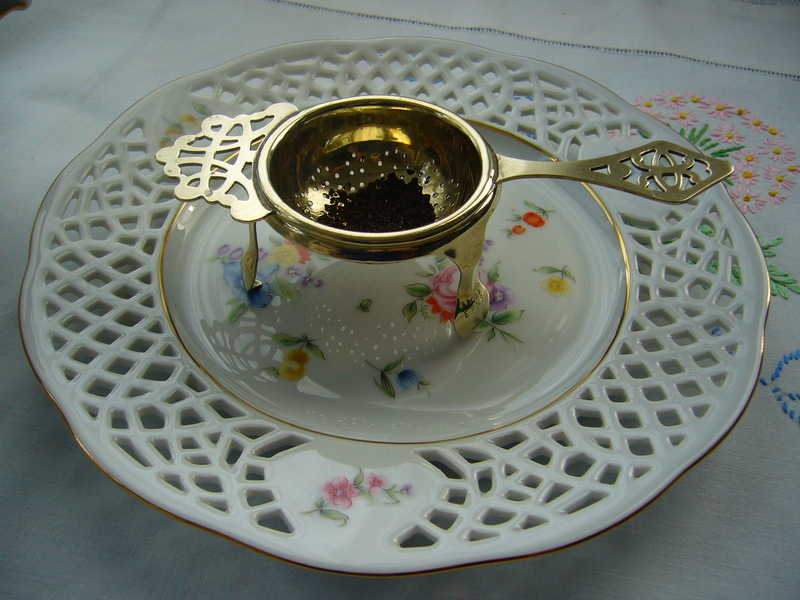 In the meantime, we can get tea strainer out and ready for action. If you take milk, add a (cold) splash to the bottom of an empty cup now. Take the tea strainer from its stand and place it over a cup. 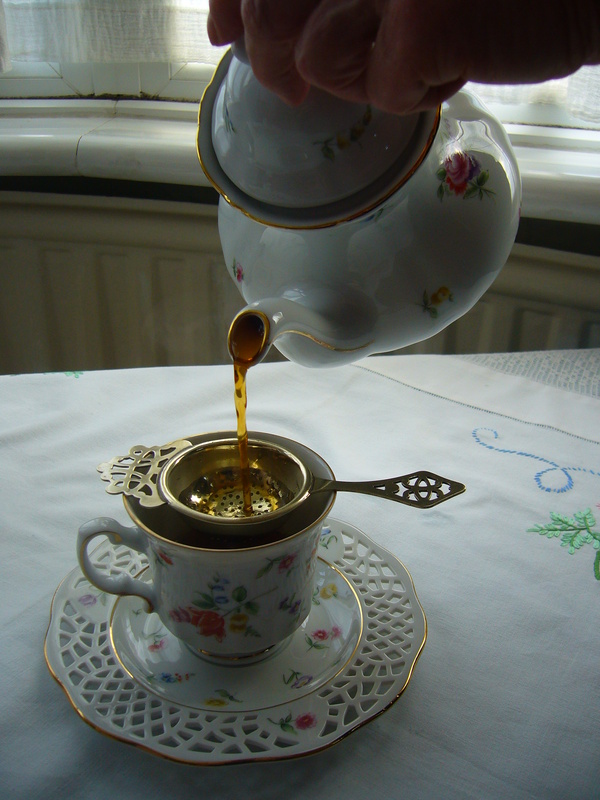 Once the tea is brewed, lift the tea strainer slightly above the cup and then pour the tea from the pot, through the strainer, and into the cup. 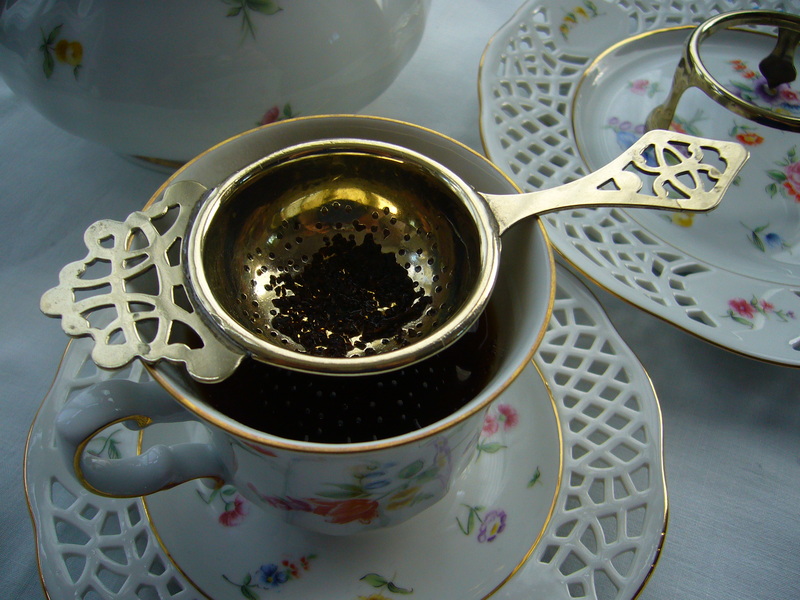 When you have poured a cup of tea you’ll be left with a slightly mushy set of tea leaves in the tea strainer. 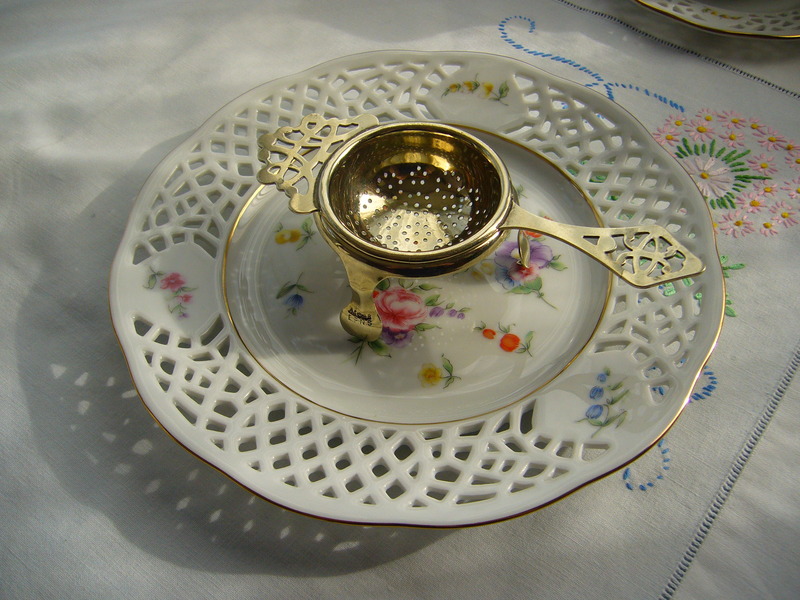 Carefully lift the strainer from the top of the cup and put the tea strainer back on its stand, which should be placed on a small plate or dish to catch any drips. Now you have a lovely cup of tea to enjoy your leisure. Once you’ve poured a cup of tea for your friends and had a lovely afternoon, remember to take care when washing up. Loose leaf tea gives the best cup of tea possible, but one drawback is the dilemma of exactly how to dispose of the tea leaves. A lot of people successfully use them in composting, but if you don’t have a compost heap then the best course of action is to place a sieve over the sink and, as you wash the used tea leaves through the teapot, catch them before they go down the plughole (this is quite important since tea lover of long-standing might eventually have blockages in the u-bend). 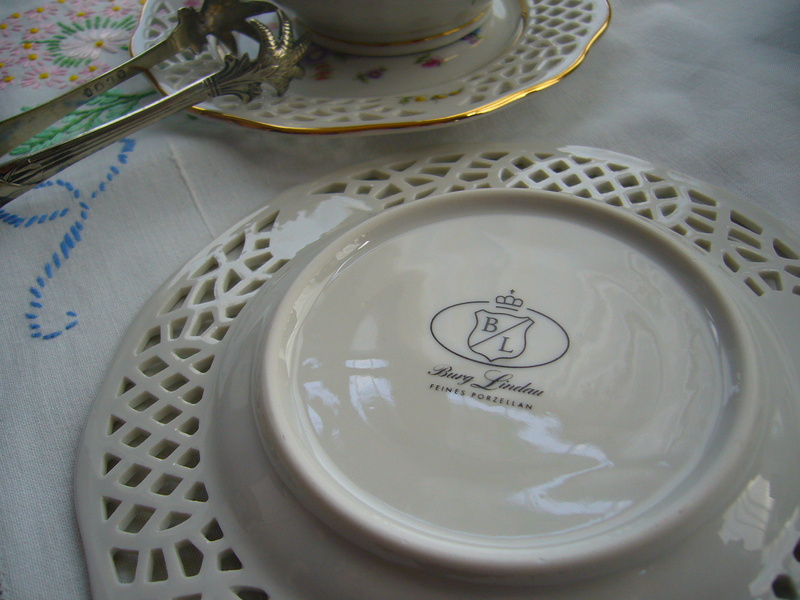 The tea set used in these photos is vintage porcelain by Burg Lindau. One of the best places to shop for a full, new tea set is John Lewis. 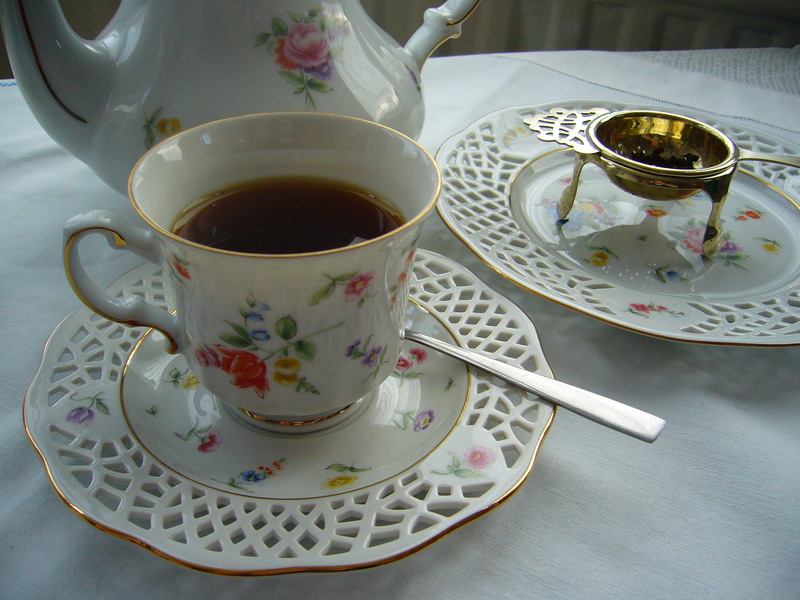 Alternatively, there are a range of antique and retro shops which will always stock tea sets if you would like to get that genuine, old English feel. I have used an antique tea strainer bought at an antiques fair, but there are a range of tea strainers for sale at Whittard’s. What a lovely tea set! Thank you! 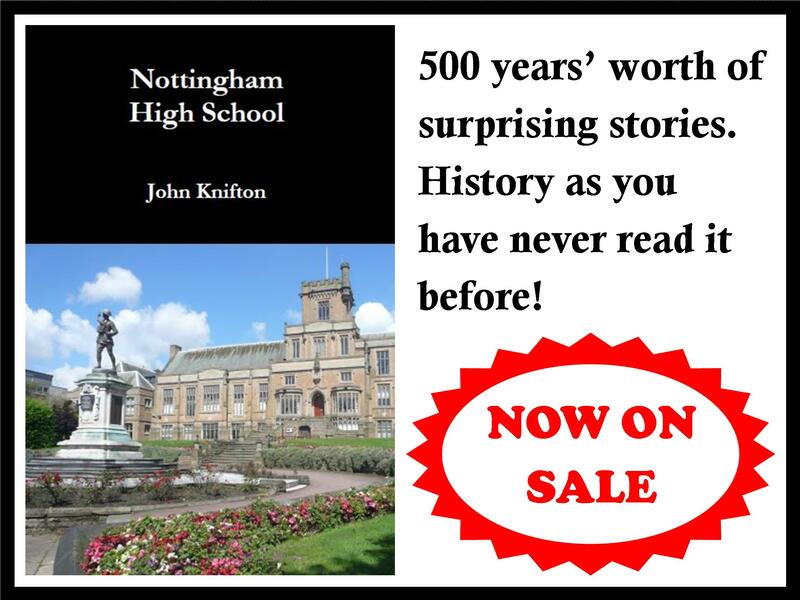 It was the find of a lifetime in an antiques shop in Nottingham, England. I have been on the search for one myself – no luck yet! Have you tried everythingstopsfortea.com ? No – I will check them out! Thanks so much! It’s my pleasure – they have some stunning items and they do have quite an affordable section for odd crockery which isn’t part of a set. There aren’t many better ways to spend an afternoon than having tea with friends. It’s even better when you add a nice piece of cake! Lovely! I feel calm just looking at these pictures. Afternoon tea is such a must. 😀 I often think that taking some time out of a busy day to just do something other than your schedule (and lovely) makes the world of difference. That looks like a decent cup of tea, lovely colour. Indonesian jasmine tea is made of Indonesian tea mixed with jasmine flowers. even when we start to pour the hot boiled water into the cup or tea pot with a some jasmine tea inside we will start to smell the jasmine flavour. soooo good, very soothing and relaxing.. 🙂 have a great weekend!